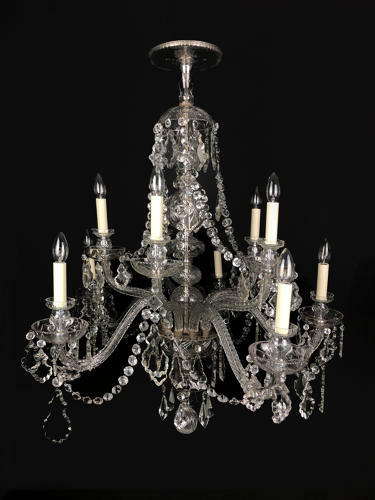 An English style, bohemian twelve arm chandelier, six lower and six upper with thumb cut hollow arms, mounted with deep set bobeches, hung with small hand cut plaques, swags with finely faceted chains of buttons. The central stem with baluster and ball elements, with spandrel cutting, capped with a dome festooned with garlands, descending to the upper arms. The lower arms interconnected with chains and plaques. Early 20th century.